Pop culture has had its fair share of “girls on fire” in recent years, including the self-proclaimed “on fire” singer Alicia Keys and the blazing heroine of the Hunger Games series, Katniss Everdeen. But anyone who finds these figures deserving of that title hasn’t met Megan Harrod. She is the embodiment of a red-hot spark — lively, bright, feisty, and never, under any circumstances, stagnant. Not that her position as the U.S. Ski Team Alpine Press Officer allows much stationary time; the media never quits, and by extension, neither does a press officer. Generally speaking, her long work days consist of supervising interviews, shuffling athletes back and forth from the finish to press pens, keeping tabs on televised appearances, and otherwise conducting the near impossible feat of keeping up with both athletes and their public representation. It’s a job meant for someone energetic, intelligent, sociable, media-savvy, and passionate for the sport — all of which inherent traits of Megan, who officially joined the U.S. Ski Team last October. I was lucky enough to catch up with her at the 2015 World Championships in Vail, and spent the day of the men’s super combined keeping up with the high pace of the fireball herself. My day with Megan began at 8 a.m. in the official housing facility of the U.S. Ski Team, the Osprey Hotel (they really can’t get enough of their predatory birds here). As I tentatively wandered through the front door, I spotted the already busy Megan lugging around a boot bag, a pair of skis and poles, and such a monstrous equipment bag that it could probably encompass a small country (Vatican City, maybe?). After organizing the heap of bags, we had some time to sit and chat, mostly about Travis Ganong’s silver the previous day, while Megan returned to her half-finished breakfast. She had accompanied Ganong from the finish to multiple interviews, a press conference, a Universal Sports appearance, the awards ceremony, a party at the Audi VIP Lounge in Vail, and a brief debut at a trustee dinner. Finally, she told me, around 8:30 p.m., the relentless succession of a podium athlete’s appearances were over — yet somehow there was still enough energy for them to burn up the dance floor in celebration a couple of hours later at Beaver Creek’s bar of choice, the Coyote Cafe. As fun as it all sounded, I had to imagine that such long days would become vaguely nightmarish after awhile, but Harrod talked about it so excitedly that some part of me wondered if the girl was even capable of complaining or getting tired — or if she was human at all? The shuttle that would take us to the Red Tail Stadium rolled up soon after, and we rushed to compose both ourselves and our staggering amount of equipment. Megan donned her good-luck Wonder Woman socks, pulling them up over her star-spangled, red-white-and-blue leggings before piling onto the little green bus. As we rode up to the hill, all I could do was listen and laugh to myself as Megan bantered with the bus riders — coaches, physios, and Beaver Creek volunteers. She joked about her wannabe boyfriend, Christof Innerhoffer, the stellar dance moves displayed the night before by U.S. men’s head coach Sasha Rearick, her infamous lifelike latex unicorn mask, and how she managed to photobomb Dennis Quaid’s selfie at the Audi Lounge. After ditching a portion of the gear at the finish area, we headed up the chairlift for inspection. From the top of the chair, the last segment of our transportation saga was hitching a ride behind a snowmobile to the starthouse. There were no drivers to be seen when we arrived at the snowmobiles, and for a brief instant, Megan displayed another side of herself which I hadn’t seen yet — a fierce authoritativeness that sparked in her voice as she called down to volunteers to ask where the drivers were. The demand was met seconds later as a driver trotted up to us, and Megan returned instantly to her lighthearted self, moping that I had gotten the faster snowmobile. I’d never inspected a World Cup downhill, so by the time we were slipping the Birds Of Prey, I was practically shaking with a mix of disbelief, exhilaration, and the vague fear that I’d tip over on the Brink and slide to the very bottom of the pitch (actually quite possible). We clicked into our skis and I tentatively made my way down, attempting to keep up with Megan, who indifferently flew down the hill and paused only to cast a few “thank you’s” over her shoulder to the volunteer course workers lining the hill. We’d come to a stop every now and then, Megan would nonchalantly introduce me to several coaches, and we’d take off again while I internally screamed with excitement. Nothing, however, was quite as incredible as coming over the top of the Red Tail jump. Megan laid down a couple casual arcs, and I followed in her wake, for the first time understanding to some level what it must feel like to go through the finish line before Red Tail Stadium’s massive crowds. After inspection, we returned to the press room, where Megan wrote her “World Cup Notes” to email out to the members of the media. It was a calm before the storm as she was soon out of her seat to take her place in the athlete area outside the finish corral. I assumed my own position in a press pen on the opposite side of the corral, where I watched the race alongside flocks of journalists. Megan would appear every now and then, athlete in tow, dialed back slightly from her usual eccentricity and demonstrating glimpses of the authority I’d witnessed earlier as journalists squished together to record the athlete’s post-racing quotes. There was no question that when Megan was on the job, she had her priorities set. After the race, it didn’t seem like much time had passed before Megan fetched me from the pressroom for the slalom inspection. We caught up with a couple of U.S. Ski Team coaches and stood with them as athletes slid by, poking fun at the out-of-place behemoth downhillers about to attempt the slalom and the spring-chicken D-Team athletes ready to forerun. After we’d had our fun, we left the coaches to their raillery and skied over to Red Tail. The stands had become an incredible rippling sea of multicolored figures and flags. The vista was too tempting; the two of us shamelessly posed for a selfie, the finish banner and colossal crowd of fans as our backdrop (#sorrynotsorry). 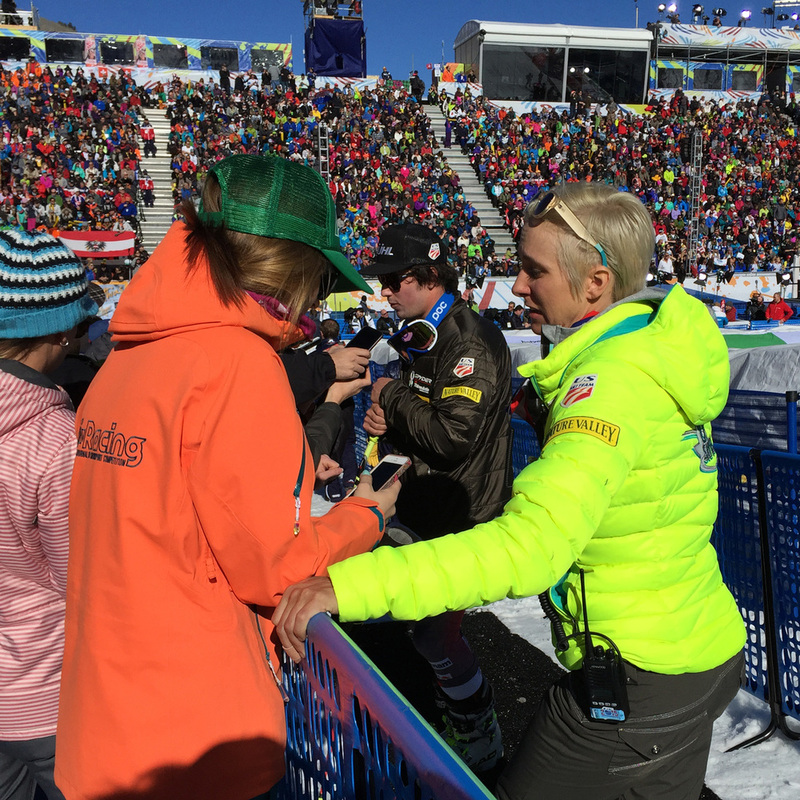 From there, Megan’s day picked up pace exponentially — Ligety received a somewhat unexpected bronze, which lined her schedule with post-podium affairs long after I’d leave the hill. I was decently tired from following her around for less than half of her work day (granted, I had binge-watched Netflix until ungodly hours of the morning the night before) and I couldn’t imagine how she’d now be continuing on to even more events. What was even more astounding is how Megan could do this, day after day, weeks at a time, and never have that flame of hers put out. There’s one simple conclusion I could work out: she really has a passion for this industry. She’s wholeheartedly committed to this unremitting world she lives in, endlessly supporting the athletes, working hard at the tasks set before her, and befriending people from all walks of skiing life along the way. Look out for the signs — officials laughing more than usual, athletes cracking grins even after bad runs, smoother-than-usual press and athlete relations, or a unicorn on skis — because where there’s smoke, there’s Megan. Lexi Black grew up racing in Sun Valley, Idaho, and is currently attending Holderness School in New Hampshire. She's a nature enthusiast and avid adventurer. Isn't Lexi just an unreal writer?! Ahhh, this throwback makes me yearn for snow and for the adrenaline rush and chaos of ski season. I can't wait! I love my job!